I was this close (picture me squinting while holding my thumb and index finger about a milimeter apart), this close to skipping this month’s Daring Bakers’ challenge. See, I have done cheesecake one, two, three, four times here already. One of those was even with the DBs last year. 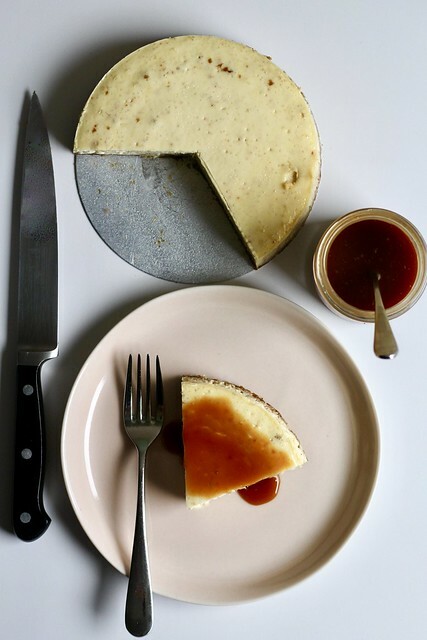 I thought about it for awhile, and then I decided that since Jenny from Jenny Bakes basically gave us free reign to modify her chosen cheesecake recipe, I may as well make some tweaks and play along. I’ve had goat cheesecake in restaurants before, but never at home, so I thought I’d give it a shot. Fresh goat cheese is pretty similar in consistency to cream cheese, and I figured I could do a straight-out swap with the two. I settled on a combo of half goat cheese and half cream cheese…that way it wouldn’t taste too barnyardy. R and I are just a family of two, so we didn’t need a several pound cheesecake on our hands (or our hips). I scaled back the recipe to a third of its original size, and decided to bake off little individual cakes. I used 4-ounce aluminium foil cups, and got four servings from the batter. 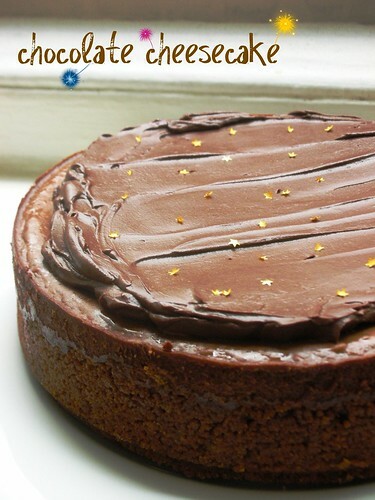 I think cheesecake is quite a heavy, rich dessert, and I don’t like it further bogged down with too many add-ins. A little fruit sauce spooned on top suits me just fine. Here, I made an easy spiced cherry compote. I simply took a jar of tart cherries in light syrup, stained the syrup into a pot and reduced it a bit with half a cinnamon stick and a couple of cardamom pods. Once off the heat, I fished out the spices and stirred the cherries back in. This was quite a nice change of pace. 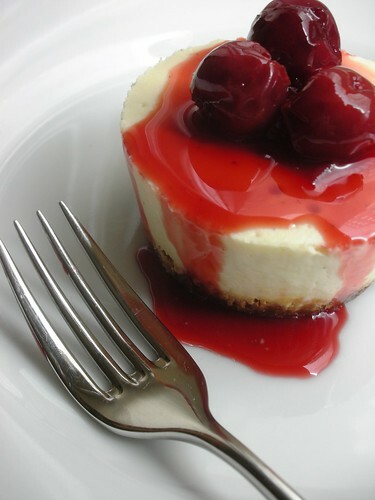 The cheesecakes had what I would call a “delicate goatiness.” Not too overpowering, and nice with the cherry sauce. 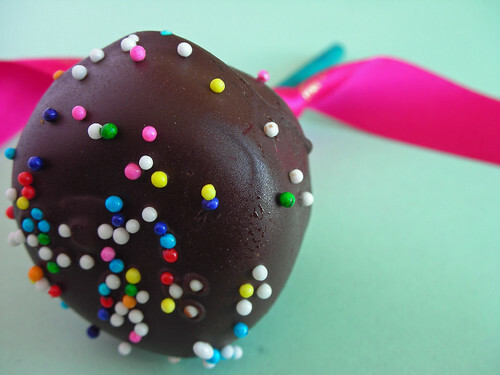 Check out Jenny Bakes for the original recipe, and visit the new Daring Kitchen site to see what everyone else is up to! Note: I used Anna’s Almond Cinnamon Thins in the crust and 1/3 less fat cream cheese (that “Neufchâtel” stuff) in the cheesecake base. -Preheat oven to 350°F (Gas Mark 4 = 180°C = Moderate heat). Begin to boil a large pot of water for the water bath. -Spray four 4-ounce ramekins or aluminum foil cups with non-stick cooking spray. Mix together the crust ingredients and press into the bottom of the cups. Place cups on a sheet tray and bake for about 8 minutes, just to set the crusts. Remove sheet from oven and set crusts aside. -Process the cream cheese and goat cheese in a food processor until smooth (don’t forget to scrape!). Add the sugar and pinch of salt; mix and scrape again. Do the same with the egg, then add the lemon juice, heavy cream and vanilla bean seeds or extract and process until smooth and fully combined. -Spoon batter into prepared crusts and gently tap the sheet tray on the counter a few times to bring all air bubbles to the surface. Remove the cups from the sheet tray and place them in a small roasting pan or a baking dish. 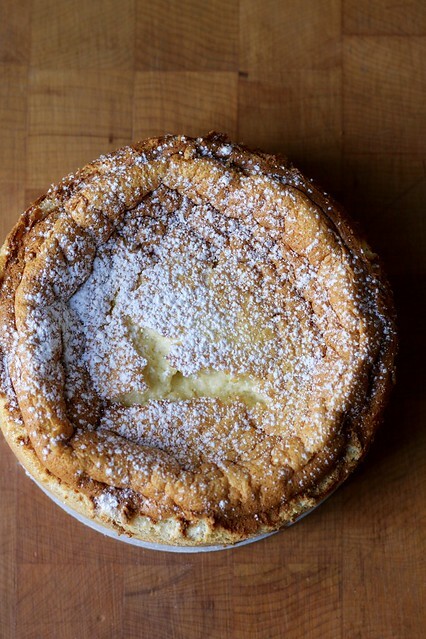 Pour boiling water into the larger pan until halfway up the side of the cheesecake cups. -Bake 20 to 25 minutes, until they are almost done – this can be hard to judge, but you’re looking for the cakes to hold together, but still jiggle in the center. You don’t want them to be completely firm at this stage. Close the oven door, turn the heat off, and let rest in the cooling oven for another 20 minutes. This lets the cakes finish cooking and cool down gently enough so that they won’t crack on the top. -After 20 minutes, remove pan from oven and lift the cups carefully out of water bath. Let them finish cooling on the counter, and then cover and put in the fridge to chill. Once fully chilled, they are ready to serve. When I saw that Anne of AnneStrawberry had chosen Dorie’s Tall and Creamy Cheesecake for TWD, my first reaction was something like “errrgh.” Now, I love me some cheesecake (one of my favorites can be seen here), but I didn’t know how I’d make it fit into my holiday eating plans. Then I realized that my holiday eating plans basically boiled down to eating as much as possible, so cheesecake would actually fit in quite nicely. I did jazz up the basic recipe to make it a bit more festive. Rather than a graham cracker crust, I made a gingersnap one. Then, I topped each piece with homemade cranberry sauce (because I love it, and must have it more often than just at Thanksgiving). 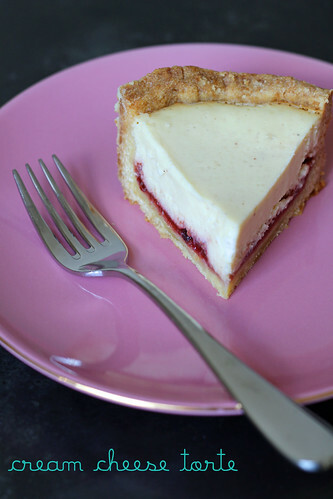 This cheesecake is fantastically good! Thanks, Anne and, it probably goes without saying, Dorie! I used 1/3 less fat cream cheese (you know, that “Neufchâtel” stuff) to make mine. Combined with full fat sour cream, it was just perfect. 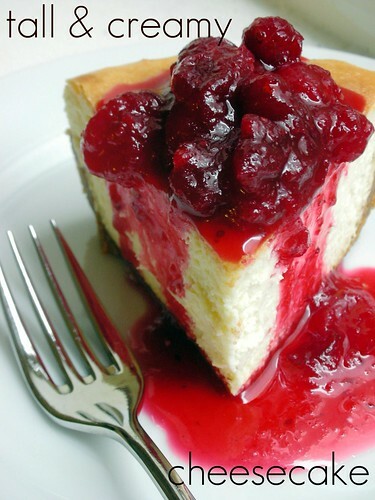 One more note: I like to use the food processor, rather than a mixer, to make cheesecake batter. It still requires a scrape or two, but as long as your cream cheese and eggs are room temperature, you will never get a lump. Oh, yeah, I also wanted to say that a half recipe works nicely in a high-sided six-inch springform. 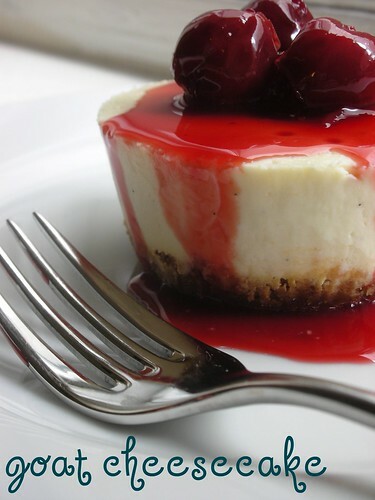 Did anyone find the instruction to let the cheesecake “luxuriate in its water bath” amusing? I was jealous– I would like to luxuriate in a water bath! For the recipe, look in Baking: From My Home to Yours by Dorie Greenspan (she also has it here on Serious Eats). You can find it on AnneStrawberry, too. Don’t forget to check out the TWD Blogroll. 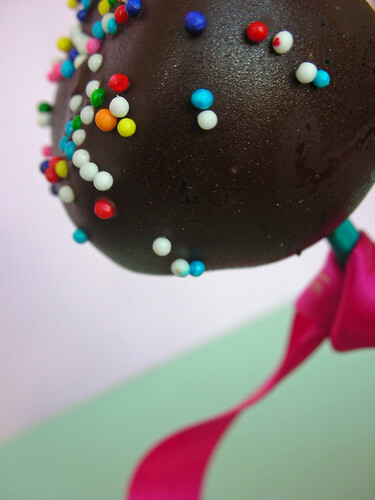 I must admit that I almost skipped making these cheesecake pops, this month’s Daring Bakers challenge. Even though I went out and searched around for lollipop sticks at the beginning of the month, I hadn’t really been in a cheesecake mood. Then I realized that the photo opportunities here were too good to be missed! The recipe, from the book Sticky, Chewy, Messy, Gooey by Jill O’Connor, was chosen by co-hostesses Deborah from Taste and Tell and Elle from Feeding My Enthusiasms. I found a recipe calling for five bars of cream cheese to be a bit much to swallow (literally). I scaled the recipe way back to just one bar and baked it in a small loaf pan. 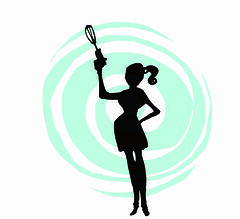 I put the batter together my favorite way– in the food processor. As long as all the ingredients are room temperature, you will never get a lump. It baked up nicely, but even the tiny amount that I made took about 20 minutes longer than the suggested time. After a night in the fridge, I used an ice cream scoop to form the set cheesecake into rough balls, and put them into the freezer for half an hour before reshaping them a bit. They still came out looking a bit…ummm….individual. Not that that’s a bad thing! The sticks are really wooden craft sticks (I had no luck finding the paper ones here), and I loved their fun colors. The packet said non-toxic, so let’s just hope that’s right! I’m not embarrassed to say that hundreds and thousands are my favorite cake decoration! Just looking at them makes me smile! I decided to roll a couple in some almond cookie crumbs mixed with a little cinnamon to get kind a cheesecake crust thing going on. In the center of these ones, I managed to hide a blob of strawberry jam. Sneaky! 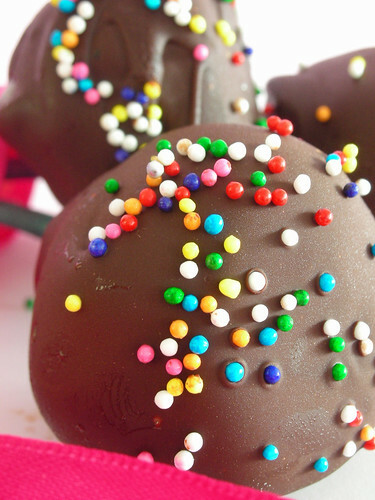 The cuteness factor is unbelievable, and they taste pretty good too! Just what I needed put myself into a cheesecake mood! Thanks Deborah and Elle! 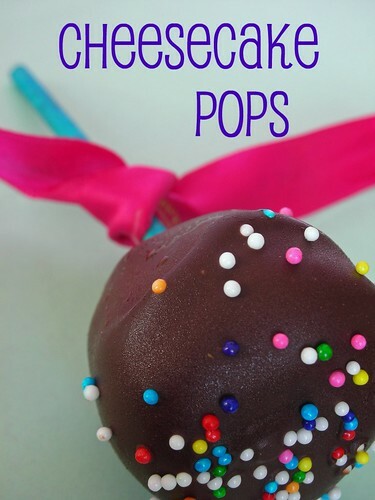 You can find the recipe for the pops on Deborah’s site. I’ve looked at a bunch of posts, and the DBers did a beautiful job this month, so please check out the DB blogroll! 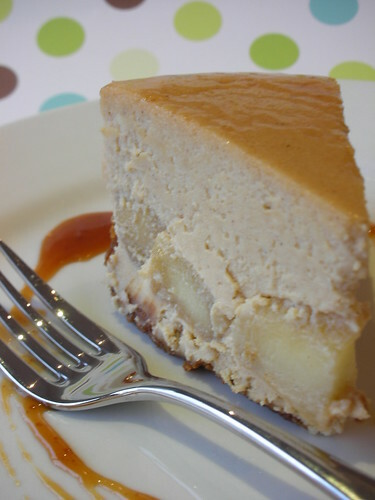 Brown Sugar-Apple Cheesecake–doesn’t that just sound so good? 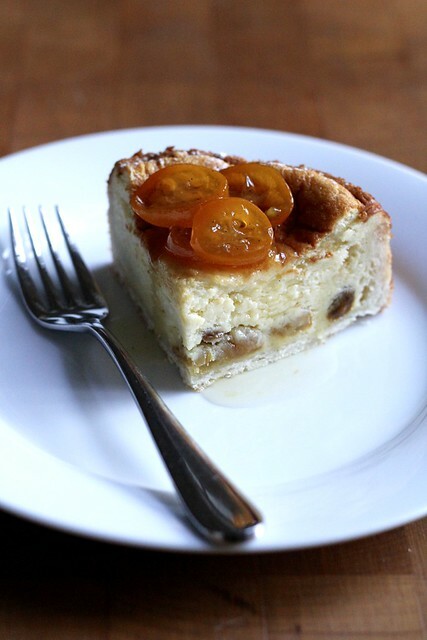 This Tuesdays with Dorie recipe was hand-picked for us by Jaime of Good Eats n’ Sweet Treats. 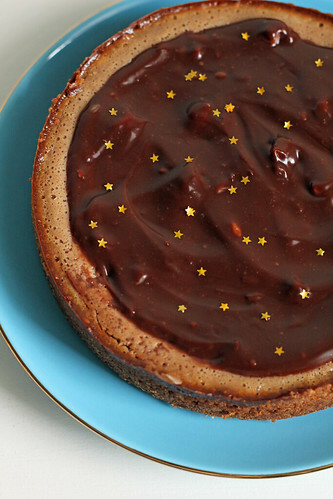 I like all kinds of cheesecake, but I’d never made one quite like this before. Usually I do the standard graham cracker crust and regular base, with maybe some type of berry coulis swirled in (here’s an example). 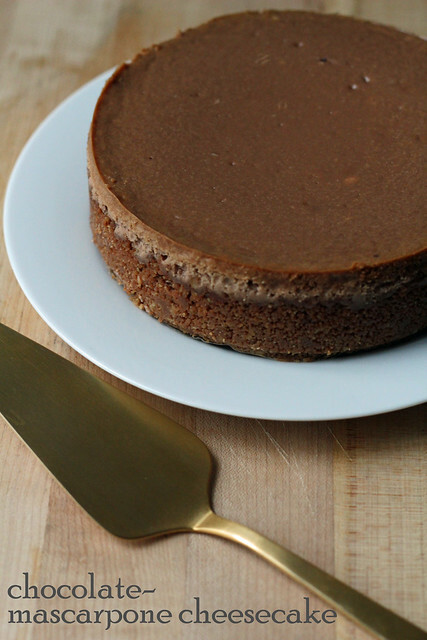 This one has a gingersnap crust supporting a cheesecake sweetened with brown sugar and cider. And there’s a layer of caramelized apples hiding inside! I was quite pleased to remember that on a trip to IKEA a couple months ago I’d bought a package of Swedish gingersnaps, and they were still unopened in my cupboard. Also, as we roll into fall here in the southern hemisphere, we are now getting “new season” apples at the market…much better than ones that have been sitting around for nine months. So all systems were go for making this cheesecake! I do often have a hard time judging when a cheesecake is ready to come out of the oven (quiche and brownies also torture me this way). Mine didn’t crack on the sides as per the instructions, but it seemed fully set, so I crossed my fingers and took it out. I was worried about overbaking it, too, since I’d halved the recipe and made a six-inch cake. Seems like it came out just fine. I had some apple jelly in the fridge, so once it was cool, I glazed the top of my cake for a little shine. I love how high up the sides the crust came. 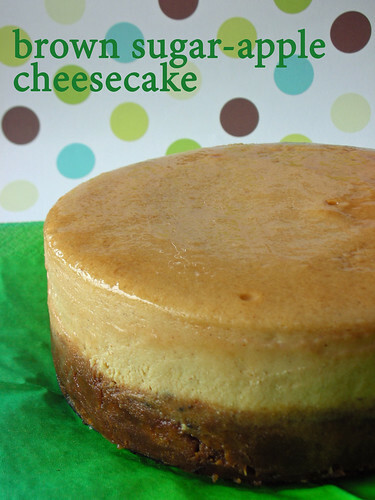 The spices (cinnamon and ginger in the base) were just right, and the cheesecake was really creamy. This recipe is from the book Baking: From My Home to Yours by Dorie Greenspan, and you can find it here on Good Eats n’ Sweet Treats. It’s really good, so thanks Jamie for choosing it! 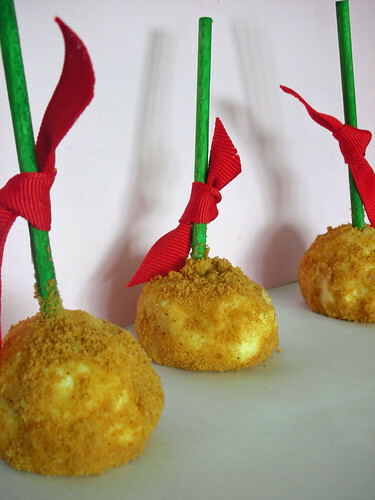 Also check out the blogroll on the Tuesdays with Dorie site to see all of our cream cheese creations this week. For my final project with the homemade graham cracker crumbs in my freezer, I decided to bake cheesecake. It had been forever since I had made or even eaten cheesecake, and luckily Philly is sold over here, so it sounded like a good plan. And I thought I would make it pink by adding some raspberries. I started with a recipe for blueberry swirl cheesecake from Donna Hay’s Modern Classics Book 2, which I’ve made several times and particularly like because the mixture comes together lump-free in the food processor. Then I added a vanilla bean to the cream cheese mixture, changed the fruit swirl to raspberry, changed the base and changed the baking method. Now is it my own recipe? I think so. 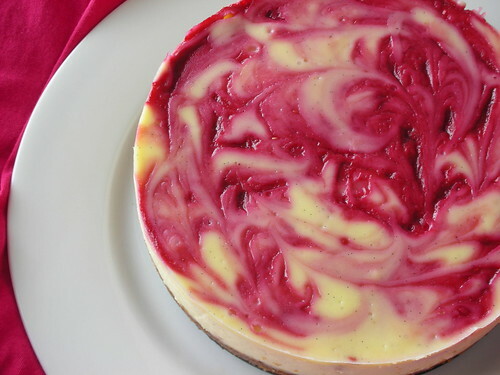 Note: If you want some extra sauce to top your finished cheesecake, make a double batch of the raspberry swirl sauce. Then use half in assembling your cheesecake and save the remaining half in a jar in the fridge for when you serve the cake. -for the crust: Preheat oven to 350°F/180°C. Combine melted butter, sugar, cinnamon, salt and crumbs in a bowl. Press into the botton of a 6-inch springform pan and bake for about 10-15 minutes. Cool crust slightly. 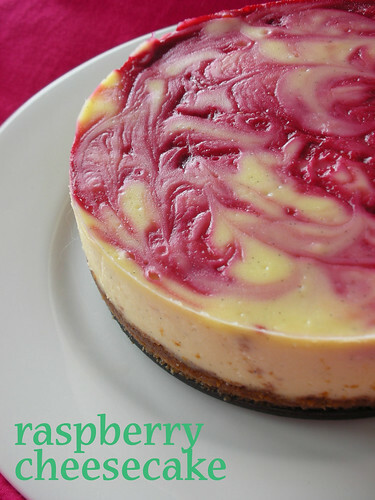 -for the raspberry swirl: In a small pan over medium low heat, gently cook the raspberries with the sugar and water until the berries begin to break down, the sugar has dissolved and the mixture has thickened a bit. Squish up the berries a little and push the mixture through a sieve to remove the seeds. Set aside to cool. -for the filling: Process the cream cheese in a food processor until smooth (don’t forget to scrape!). Add the sour cream, egg, sugar and vanilla bean seeds and process until smooth and fully combined. -to assemble: Brush sides of the springform with a little softened butter. Wrap the outside of the pan with a double layer of foil. (The cake bakes in a water bath, and doing this will help keep water from seeping into the cake as it cooks.) Pour the filling over the graham cracker base. 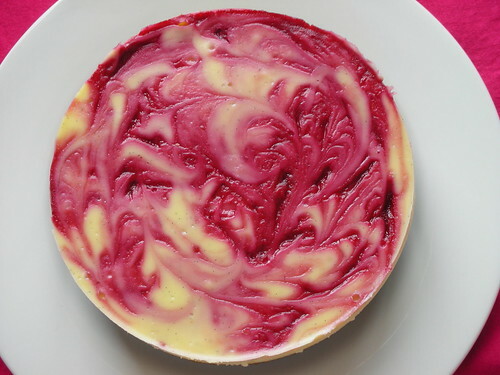 Drizzle the raspberry sauce over and swirl gently with a butter or pairing knife. Create a water bath by placing the cake tin in a slightly larger roasting pan or baking dish. Carefully pour hot water halfway up the sides of the springform. Bake at 280°F/140°C for a little over an hour, until the edges look set but the center jiggles slightly. Let cool on a rack, then cover and refrigerate for several hours before serving.